What is the Pledge Payment Report? 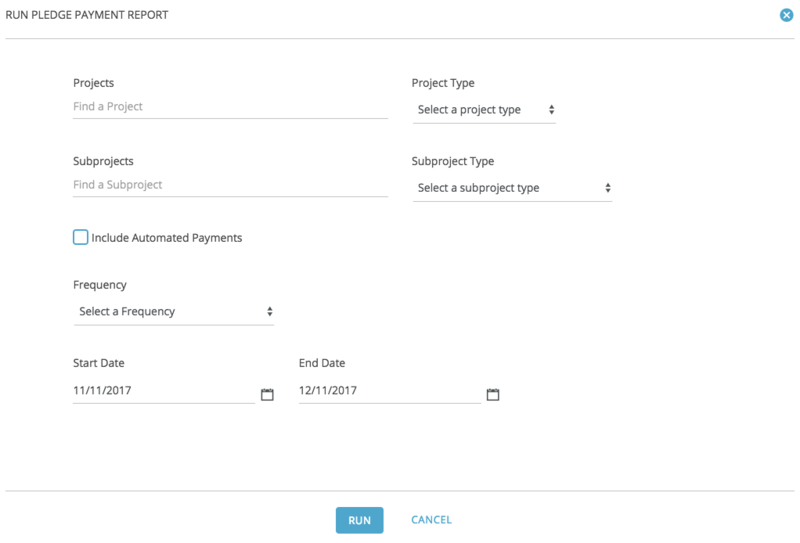 The Pledge Payment report was designed to allow organizations to view a list of Pledge payments due in an upcoming month and be able to send out paper statements/payment reminders to those recurring givers who pay via check. The report includes options for viewing either all Projects or specifying a group of Projects by Type. To report on all Projects, just leave the Project field blank when running the report. By default, the report will ONLY include Pledges where the "Future payments to this Pledge are automatic" option is NOT checked. To include all Pledges, be sure to check the box for the "Include Automated Payments" option. Since this report can be run for any time period, it can also be used to view pledge fulfillment totals for any specified time period. Use this data to monitor pledge fulfillment and see if your recurring givers are keeping up with their commitments.